…but current solutions are catered to large corporations and municipalities. When NuLeaf says water for everyone, we mean it. Invest in a new technology that invests in you. It’s time to take back your water. Bottling Nature’s Genius--One Plant at a Time. Don’t let the size fool you! Our system takes inspiration from nature to provide all the benefits of a large garden in small package, suitable for indoor or outdoor use. Sowing the Seeds of Sustainability, the Easy Way. Water your needs? We got you! The nutrient recycling technology behind our NuTree is great for a number of different use cases. From in-home urban farming to industrial water treatment solutions, we’ve got you covered. We are committed to meeting your needs as a customer, and we will work with you to ensure that you get the perfect system for you. *If you have something specific in mind, follow the link below to contact us about custom systems are services. 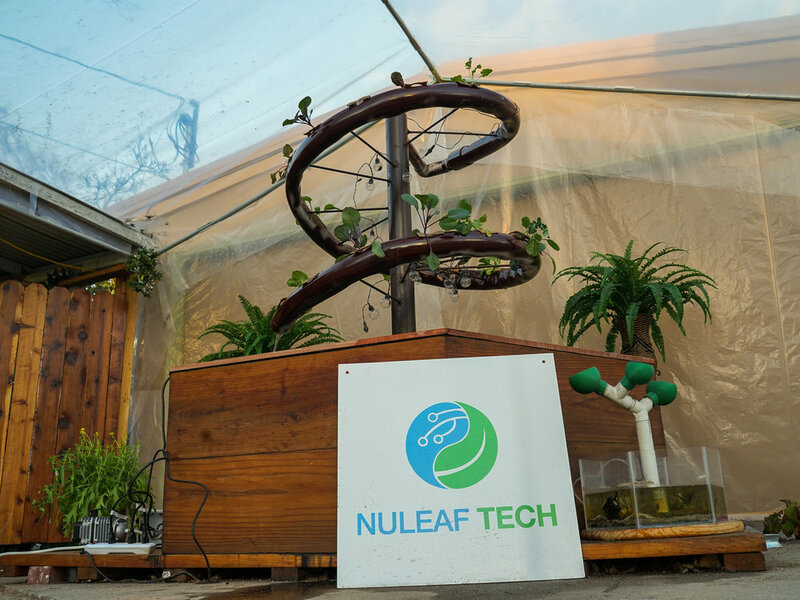 NuLeaf began as makers tinkering with biotech to create cleantech solutions. As California natives, we have seen firsthand the impact of drought and water scarcity and this greatly influenced our work. We became entrepreneurs when we grew tired of waiting for the world’s wastewater problems to solve themselves. Today we build technology that enriches the lives of regular people everywhere through water-smart resource management. Empowering communities and individuals to treat and recycle their own water using nature’s methods. A global community of individuals, industries, and nature that turns water conflict into resource innovation. NuLeaf got our start at the NASA Ames Research Centre in Mountain View, California. In 2015 we brought them our idea of bridging bio-inspired design and clean tech to create nature-inspired solutions for resource scarcity. As more and more people started to contact us, it became clear that we were on to something big. We outgrew our project at NASA and in 2016 NuLeaf became a makerspace for youth environmentalists and biomimetics. In 2017 NuLeaf incorporated, ready to bring our solutions to the world. We participated in the SOSV RebelBio accelerator program where we built our first aquaponics system at University College in Cork Ireland. Since then, NuLeaf has built and tested our first NuTree system for wastewater treatment as well as our NuTree Garden system designed for at home urban farming. We are currently working with high-water industries like breweries as well as local municipalities to provide an alternatives to septic tanks and other water issues. We are also launching our NuTree garden system for an easy at-home urban farming system. Our team is a group of hard-working scientists, makers, and entrepreneurs committed to creating concrete steps for mediating climate change. We have a wealth of experience building aquaponics systems and working in the wastewater field that helps us create these solutions. Rachel has degrees in biology, chemistry, and management and is an avid tinkerer and writer. She’s dedicated to creating practical, scalable solutions for a circular economy through the creative combination of bioengineering and do-it-yourself tech. Jimi has a background in business management and computer science. His interests include programming and emerging technologies. Jimi is passionate about turning good ideas into working businesses so we can work find creative solutions to complex, global issues. Ari studied biology with a particular interested in biochemistry and is a self-taught microbiologist. He is interested in the sustainable distribution and equitable management of essential resources by channeling the makers' mentality. Kendall is an accomplished copywriter and devoted social media manager whose poise and compassion help her to build and maintain meaningful relationships in business and in life. She is a devoted environmentalist who believes in doing work that will help people live better lives.